A listing exercise can be one of the most ambitious and frustrating things company founders, managers and shareholders ever experience. The myriad regulatory hurdles, listing costs and sheer uncertainty of the market buying into your company are just some of the forces governing any public listing. And that is even before you are cleared to list. There are several common threads when it comes to listing on a foreign stock exchange. For one, Malaysian companies tend to favour bourses in Hong Kong, Singapore, Australia and the UK. Also, they prefer to list on secondary boards due to the lower entry requirements and more forgiving disclosure regulations. Local companies seem to avoid listing in the US because of the onerous disclosure requirements and litigious nature of the securities scene. Enterprise speaks to a few experts to demystify some aspects of listing and examine which bourses to look at when considering an overseas listing. Here are a few key considerations when picking a bourse to list on. As far as listing destinations go, Hong Kong has dominated the listing action in recent years, says Munir Abdul Aziz, deputy managing partner at law firm Wong & Partners. “Hong Kong currently attracts the highest proportion of cross-border listings. Many companies list there to tap China’s consumer market,” he adds. Munir and Liew say Malaysian companies generally prefer to list in the region. So, it has always been a toss-up between Singapore and Hong Kong. Hong Kong recently stole a march on Singapore, says Munir, due to the challenges faced by the latter’s stock exchange. “One of the reasons Singapore’s mainboard is not so attractive at the moment is the perception that the market is not very liquid. Trading volumes tend to be quite thin and this does not excite promoters and major shareholders,” he adds. The prospects are not all gloomy for Singapore though. Munir says a key trend among Malaysian companies is their propensity to list on the secondary boards of major financial markets. In this regard, the Singapore Exchange’s (SGX) Catalist board continues to attract the attention of Malaysian firms. “Singapore’s Catalist is attractive because the listing requirements are quite liberal and it does attract a fair amount of interest from investors. In fact, the biggest Catalist listing of a Malaysian company was undertaken by tax advisory and business consultancy Axcelasia. That was a deal we worked on,” says Munir. An RTO refers to a process by which a private company buys enough shares in a public-listed company to take control of it. It is said to be an easier route to listing. On its part, Singapore has done well to attract technology listings in recent years, in addition to getting such companies to move their headquarters to the city state. “One example, of course, is Grab. The home-grown company has moved its headquarters to Singapore,” says Munir. One of Southeast Asia’s few unicorns, ride-hailing giant Grab had been the subject of IPO rumours in the past. The prevalence of venture capitalists, investors and technology enthusiasts in Singapore, as well as the lacklustre performance of its mainboard, means that Catalist is attracting a lot of tech companies with a view of listing, he adds. Over the years, some boards evolve to become quite lucrative destinations for certain industries. It is always a good idea for companies to see where their industry peers have been and, more importantly, how they have fared. There is no shame in being a follower. Sometimes, a road is less travelled for a reason. “Some companies tend to flock to a certain exchange mainly because they have industry peers there that offer some kind of insight into the price-earnings ratio (PER) benchmark for that jurisdiction. 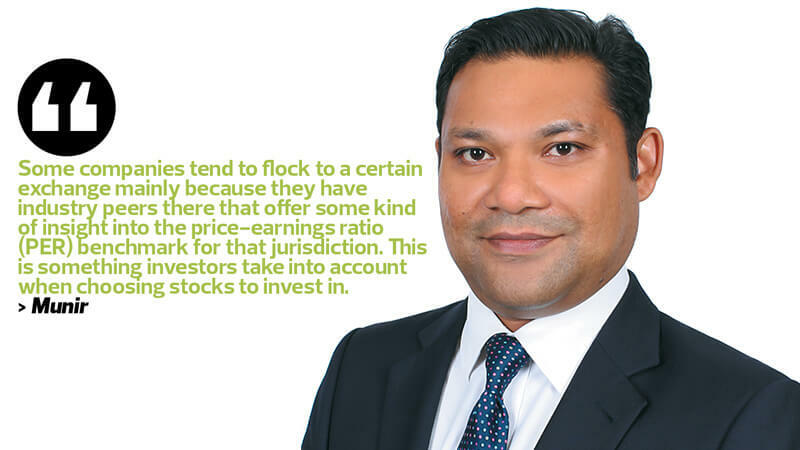 This is something investors take into account when choosing stocks to invest in,” says Munir. Munir was involved in the IPO of Malaysian bereavement services giant Nirvana Asia Group. “At one point, it was listed on Bursa. But the principal owners decided to delist it, so they invited some private equity investors to buy into the company,” he says. “Not long after that, they decided to list in Hong Kong because they were clearly trying to grow their Chinese business. Another reason they chose Hong Kong was because they were aware of earlier listings of similar companies that had commanded attractive valuations. Real estate investment trusts (REITs) are a particular speciality of Singapore, and both Liew and Munir say the SGX provides a strong ecosystem for any REIT. “REIT listings are more mature on the SGX compared with Malaysia. The simple reason is investor appetite within the jurisdiction. They are simply more familiar with such an investment space, which aids greater price discovery when it comes to IPO pricing,” says Liew. As a result of Singapore’s mastery in listing REITs, the investors who come along are of similar high standing. “Those who invest in REITs are typically looking for steady yields by way of dividends. This is very interesting to pension funds, sovereign wealth funds, university endowments and insurance companies,” says Munir. Businesses should always endeavour to understand local risk factors before making any decisions. Quite often, risks factors only tend to be known once a company has fully committed to listing in a certain jurisdiction. By then, the consequences could be devastating. Munir cites the US as an example. “There are a variety of reasons the US may be a challenging market to list in. For instance, the extent of disclosure requirements and the nature of ongoing obligations and responsibilities that you take on by listing there can be onerous,” he says. “Above all, the US probably has more securities lawyers than any other country on a per capita basis. These people do nothing but comb through companies’ prospectuses and offer documents to find cases of misrepresentation or material omission.